This solution reduces costs and risks, facilitating the launch of new products and entering new markets for agri-food businesses. The company is about to open its second hub in India as part of a global network of factories covering 40 locations in the coming years. Premium Ingredients Food Services India, part of Blendhub, a company supporting food brands with formulation, raw material searching and purchasing, and supply chain optimization, will open its second hub in Chennai to host food powder blends for the domestic market and introduce CloudBlending in Asia. CloudBlending is a new business model boosting an end-to-end supply chain system and giving companies access to food powder blends as a service anywhere in the world at the best price. As a complete solution, it allows Indian companies, using and selling food powder blends, to position themselves in any market and launch new products both domestically and worldwide, optimizing costs. Likewise, any other business with interest in entering or operating in India can use the CloudBlending solution for hosting food powder blends. Blendhub proposal will help food businesses solving manufacturing challenges such as product development, personalization, and adaptation to new niches, logistics optimization, production peaks, and formulation. All this based on a unique pay per use model, without initial or operational investment. The business model Blendhub is introducing in the Indian market is supported by a global network of hubs connected in the cloud and the know-how of a worldwide community of thousands of agri-food professionals. The model adds instant value to any product and allows to manufacture anywhere with top quality and controlling and analyzing every batch of the final product. The new Indian plant is part of Blendhub’s growing network that will localize 40 hubs in the coming years. The company has already operational hubs in Spain, Mexico and Dubai for hosting food powder blends. As CloudBlending is a service model, clients have all kinds of choices when hosting food powder blends. They can produce their own formulations or use Blendhub’s formulation team and community support. They can also choose between using their raw material providers or gain access to Blendhub’s ecosystem, or even outsourcing their whole supply chain to enter new markets or launch new products without initial investment and using Blendhub as a partner to reduce their entrance risks. CloudBlending is a global and customized solution for a world demanding more sustainable solutions to face the global challenge of feeding a growing population with limited resources. Blendhub is leading this process of transformation inviting companies, producers, social entities and partners of all kinds to join CloudBlending movement to create shared value and increase access to food taking advantage of a social and inclusive model which benefits the whole value chain. They are production centers connected in the cloud with the company’s network of plants or portable factories offering all the necessary services for sourcing and requesting raw materials and formulation, and blending and packaging, always guaranteeing the quality of both raw material and finished products. 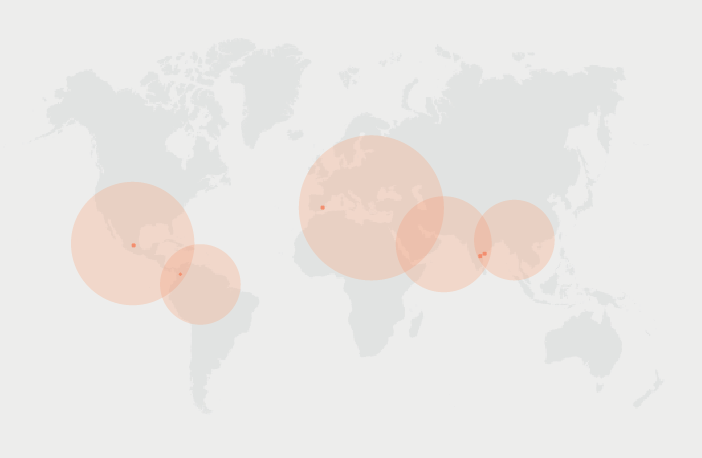 Also, Blendhub can provide any client with the best location worldwide to produce with this system.